In the summer of 2011, just after Nour loses her father to cancer, her mother moves Nour and her sisters from New York City back to Syria to be closer to their family. In order to keep her father’s spirit as she adjusts to her new home, Nour tells herself their favorite story—the tale of Rawiya, a twelfth-century girl who disguised herself as a boy in order to apprentice herself to a famous mapmaker. But the Syria Nour’s parents knew is changing, and it isn’t long before the war reaches their quiet Homs neighborhood. When a stray shell destroys Nour’s house and almost takes her life, she and her family are forced to choose: stay and risk more violence or flee across seven countries of the Middle East and North Africa in search of safety—along the very route Rawiya and her mapmaker took eight hundred years before in their quest to chart the world. As Nour’s family decides to take the risk, their journey becomes more and more dangerous, until they face a choice that could mean the family will be separated forever. Following alternating timelines and a pair of unforgettable heroines coming of age in perilous times, The Map of Salt and Stars is the epic story of one girl telling herself the legend of another and learning that, if you listen to your own voice, some things can never be lost. Zeyn Joukhadar is a Syrian American author and a member of the Radius of Arab American Writers (RAWI) and of American Mensa. Joukhadar’s writing has appeared in Salon, The Paris Review, The Kenyon Review, The Saturday Evening Post, and elsewhere and has been nominated for a Pushcart Prize and the Best of the Net. Joukhadar is a 2017-2020 Montalvo Arts Center Lucas Artists Program Literary Arts Fellow and a 2019 Artist in Residence at the Arab American National Museum. "The ancient, sometimes mystical connection between maps, people, and knowledge is central to Jennifer Zeynab Joukhadar's The Map of Salt and Stars, a double tale of voyage and exile that moves between contemporary war-torn Syria and the caravansaries and khans of its lost past....What Joukhadar does beautifully is to connect, in a vivid and urgent way, Syria and the United States....The Map of Salt and Stars is important and timely because it shows how interconnected two supposedly opposing worlds can be. Our many stories are part of the same larger tale, part of the same larger map." 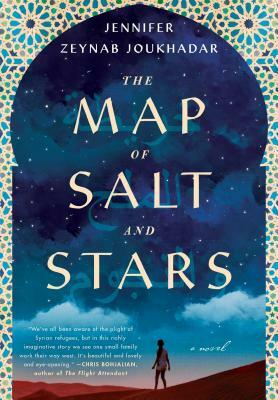 "The Map of Salt and Stars is the sweeping, thrillingly ambitious tale of Nour, Rawiya, and their parallel searches for home. In twin narratives that unfold eight hundred years apart, Joukhadar captures the unrelenting courage of those who persist amid the trials of exile. A truly remarkable debut." “Every once in a while, a novel comes along that perfectly aligns with the cultural moment. “The Map of Salt and Stars” is that kind of book. . . The finest literature tells the one story that stands in for the many. John Steinbeck accomplished this with the Joad family in “The Grapes of Wrath,” and Zeynab Joukhadar has written a novel with a similar weight and power about Syria’s displaced people. Indeed, her novel speaks for all the refugees, from the Mideast to Europe to Central America, who are fleeing political violence and repression and want only to find a safe place to call home. Nour’s voice makes it difficult to ignore their plight." "Navigation is the theme of this novel built around two voyages. The first is a refugee’s journey as 11-year-old Nour, who was born in New York, returns with her mother to Syria, only to face conflict and a bombed-out home. This story is twinned with a fabulous tale of a medieval expedition to map the Arabic world guided by the stars, creating a work that is both magical and heart-wrenching." "Beguiling...brings an intimacy to what is one of the stories of our age...Joukhadar's prose is like a dream." "In her rich and often heartbreaking debut, Syrian American writer Jennifer Zeynab Joukhadar tries to make whole the broken memory of a nation caused by the deadly conflict in Syria....Joukhadar's vibrant prose brings to life the very real and devastating struggle that many refugees face today." "The Map of Salt and Stars is a harrowing adventure that treasures storytelling and emphasizes the importance of knowing one’s origin and discovering one’s destiny. With terrifying risks, upsetting tragedies, and a touch of romance, this beautifully executed and moving story is unforgettable." "A stunning dual narrative about families, crossing borders, and finding a new way home....Joukhadar's absorbing narrative offers a vividly particular glimpse into the refugee crisis and two unforgettable heroines united by their bravery and hope." "Debut novelist Joukhadar gracefully balances the gritty, often horrific truth of the refugee's plight with the lyrical near-fairy tale she has created....A wise, vibrantly told story for a wide range of readers, particularly relevant now."